THE MODELThis model of the Wasp is a plank on bulkhead hull. The bulkheads and spine are basswood. The hull planking is cherry with bass wood planking for the band at the gun ports. The model is finished with minwax. Coppering is copper foil tape with nails simulated. The deck is planked in basswood as well with deck seams simulated with graphite. 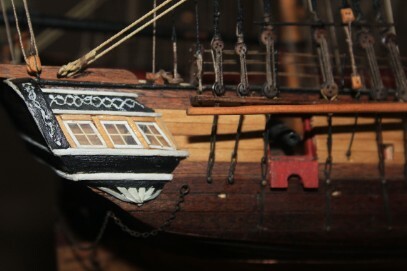 The deck furniture, capstan, pumps, companionway with binnacle cabinet, carronade slides, cannon carriages, fife rails, pin rails etc are scratch built. Chains and chain plates are also scratch built. Note the compass and lantern in the binnacle. The plans used come from the Smithsonian Collection that appears in “The History of the American Sailing Navy” by Howard I. Chapelle, 1949. 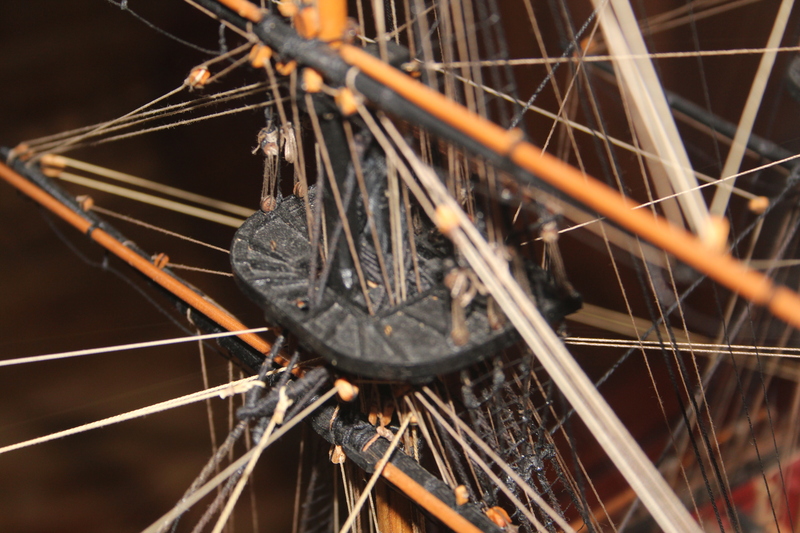 The belaying plan was derived from various articles and “The Masting and Rigging of English Ships of War” by James Lees, 1984 Edition. Rigging and block sizes are derived from Lees as well as “Tables Showing the Masts and Spars, Rigging and Stores of Every Description Allowed to the Different Classes of Vessels Belonging to the Navy of the United States”, Board of Navy Commissioners, Washington, Printed by Peter Force 1826. This was not exclusively taken as a reference due to the 1826 date but was compared with Lees and Steel. The Wasp was built by Josiah Fox in 1807 at the Washington Navy Yard. Originally designed as a Brig, the Wasp was converted to a Ship before her launch. She is the second ship of the US Navy to bear the name Wasp. On October 17, 1812, the Wasp, under the command of Captain Jacob Jones, sighted a convoy bound for England. The convoy was being guarded by HMS Frolic, a Brig of 19 guns. In a fierce 43 minute battle the Wasp captured the Frolic. Both ships were heavily damaged. A few hours after the battle, while repairing the damage, the ships were sighted by HMS Poictiers 74. Wasp attempted to escape but was overtaken because her topsails were shot to ribbons. Both Frolic and Wasp were taken into Bermuda. The Wasp was purchased into the Royal Navy and renamed HMS Peacock. The following year, she was lost off the Virginia Capes. 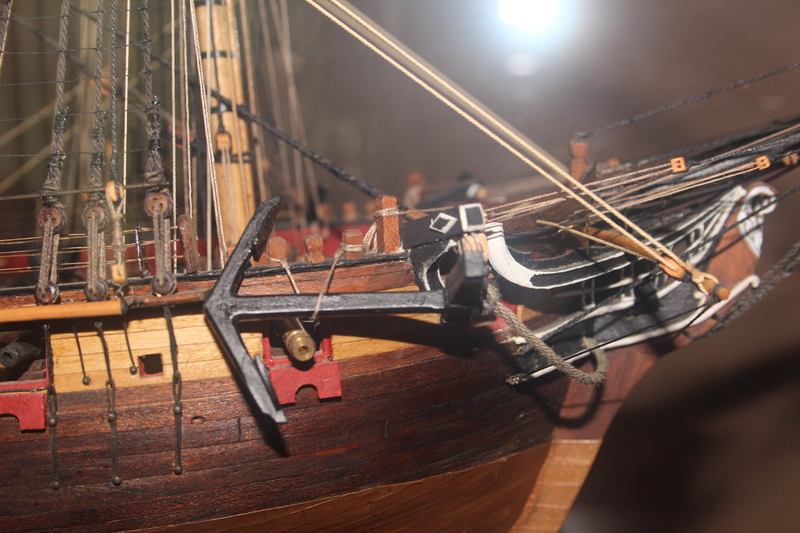 Anchors, ship’s wheel, carronade and cannon barrels, blocks, dead eyes, belaying pins are purchased items. Masts are birch with tape mast bands. All masts, fighting tops, trestle trees etc are scratch built. Rigging line for the larger lines was turned up in a small rope walk. The Navy of the United States”, Board of Navy Commissioners, Washington, Printed by Peter Force 1826. This was not exclusively taken as a reference due to the 1826 date but was compared with Lees and Steel. 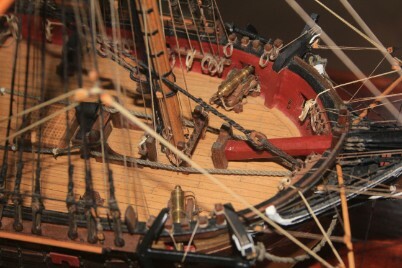 The Model was on display in the Washington Navy Yard Museum during the bicentennial of the opening of the yard as Wasp was the first ship built there.